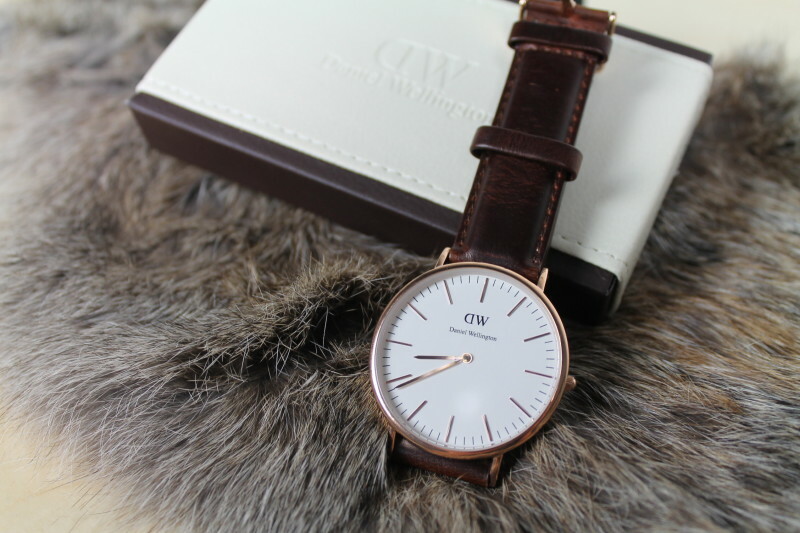 Home » Brands » Daniel Wellington Watch Review – Why Are They So Popular? Miles May 8, 2017 May 8, 2017 No Comments on Daniel Wellington Watch Review – Why Are They So Popular? 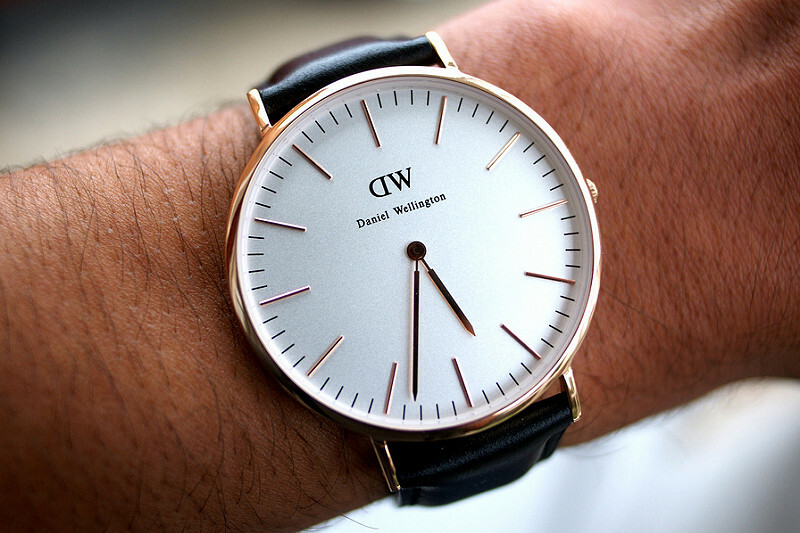 Welcome to the Daniel Wellington Watch review. The Classic Bristol. That goes without a doubt when it comes to computers, GPS, phones, hell, even my coffee maker can sync with my phone. We also seem to be entering the phase of the smartwatch. Is it a fad? Who knows… It makes me think people do not even take it seriously anymore after Apple released the exact same watch they debuted one year earlier. Much to the ooh’s and ahh’s of way too many fanboys, there were no welcome improvements to smartwatches within the last year and a half. 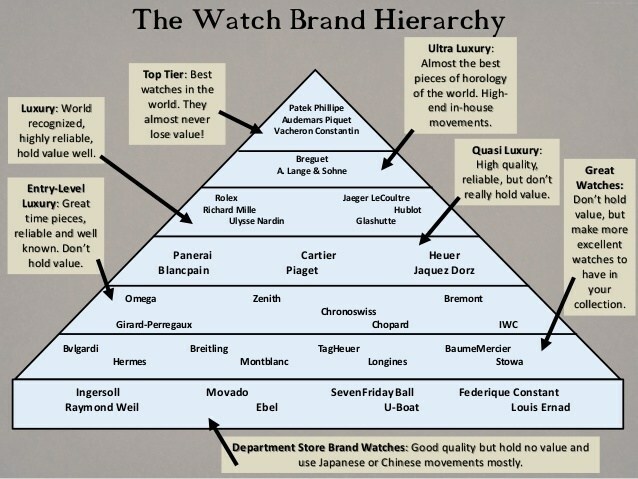 Even though we live in this so-called digital age, sometimes, most times, style prevails in the watch industry. At the end of the day, we all want to look good. Get noticed. When watch styles compliment, yet are fresh and traditional it gets noticed. With all the connectivity that exists in this world (Skynet!) sometimes, it feels good and refreshing to disconnect. 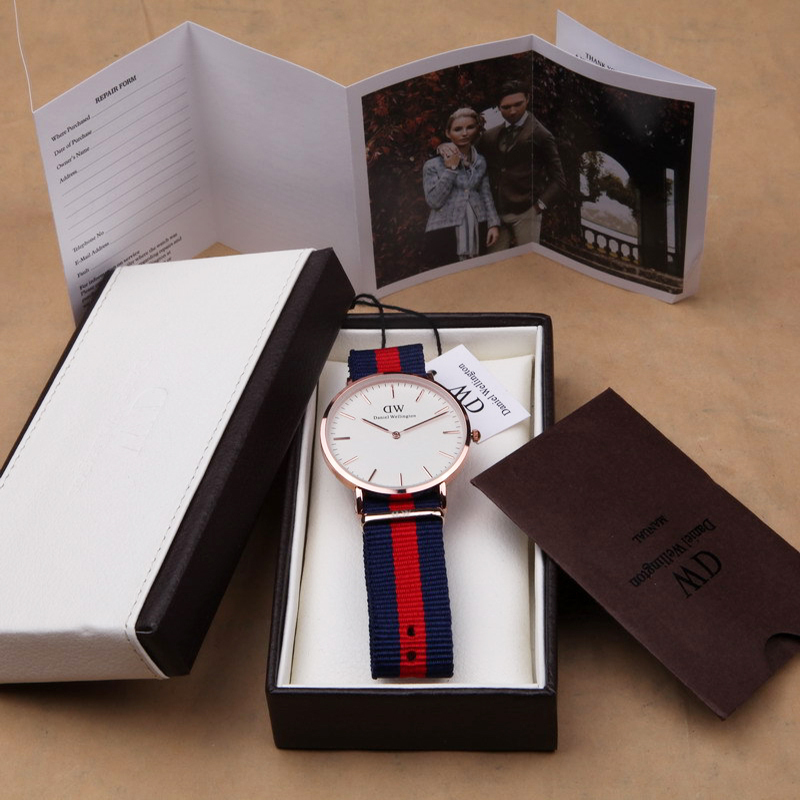 Enter my Daniel Wellington Watch Review. I chose to do a review on the Daniel Wellington Watch series because of the look and feel of these great watches. Simplicity is not a bad thing in this complicated world. Elegance still stands for something today. So why not have it stand out when we are being casual, yet can be dressy enough for the formal occasion. I must say that this watch comes with the full experience. From the enjoyment of the watch, all the way to how it got shipped to you or purchased. The contoured box includes a leathery top that is actual real leather. It is cream colored and for some reason seems to compliment the watch itself very well. I will just chalk this up to the extreme level of detail. Finally off to the good stuff… the watch! This Classic Bristol model copies the Apple iPhone brand by being available in Rose gold and silver. I must say that the rose gold is definitely an eye catcher. I would not say that either color lends itself to being masculine or feminine. On a female wrist, this watch would look just fine no matter the color. On my wrist, the gold just happens to compliment my skin tone which is helpful when making a buying decision. When it comes to matching clothes with your decision, it really depends on your wardrobe. The colors are neutral enough to work with a number of combinations. 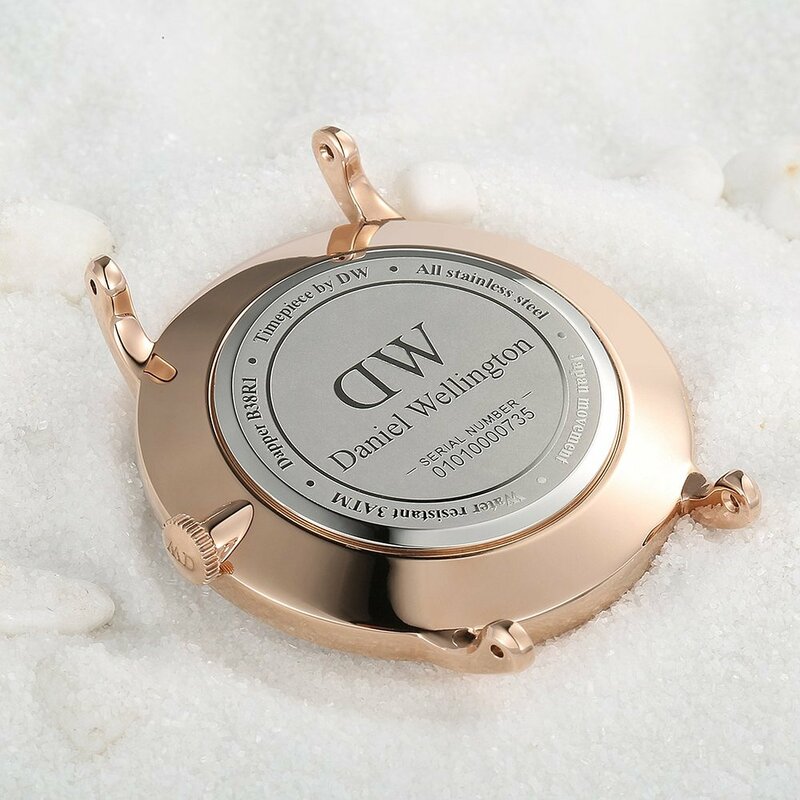 If you look at the Daniel Wellington site, you will notice that a lot of the models happen to be in the sepia color filter, so everything looks reddish, yellow. It is annoying. Can I just get a normal shot of the watch? Before buying be sure to get as many pictures as you can NOT from their site so that you can get an accurate representation of what the watch will look like on your wrist. This is especially important when buying second hand. The casing is immaculate and extremely thin standing at an impressive 6mm. How in the world do they fit a watch in there???? 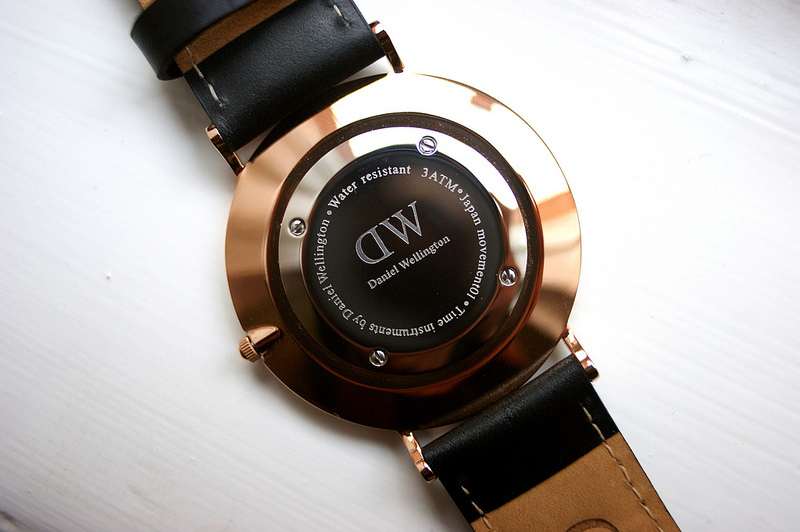 You will find the same design on the back with other specifications with the DW branding. The face across comes in at what I consider and extremely comfortable 40mm. Not too big, not too small. I can read it from a comfortable distance which is a big deal for me since I have been wearing glasses since middle school. So to wrap up all this talk about the body, I must say the most impressive and important features of this watch so far has got to be the size. 40mm across and an impressive 6mm thick assures that it fits on your wrist perfectly and is very lightweight weighing in under 2.5 oz. Just being honest the strap is not much to write home about… It is genuine leather, which is a good and bad thing at times due to durability, but as long as you keep it away from the elements, it should last a good while. 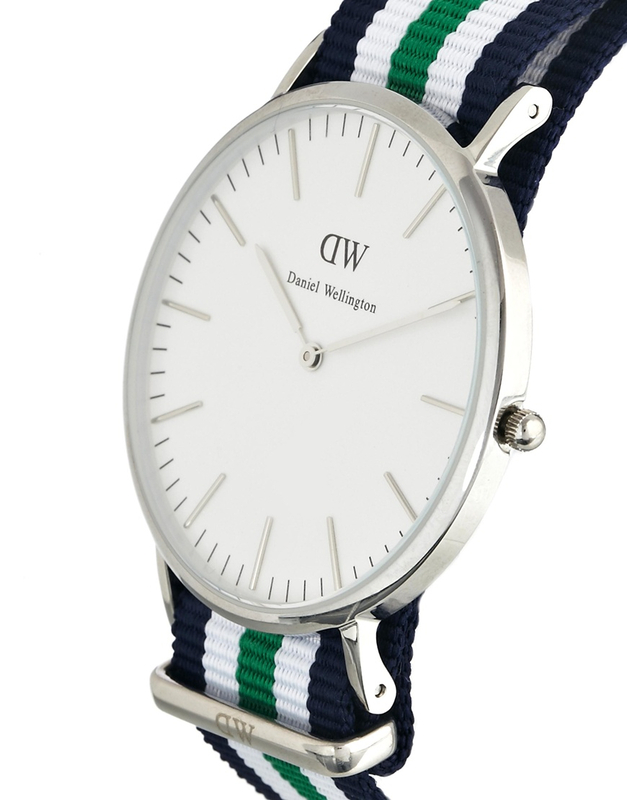 The stitching is classic and traditional which is what I come to expect from the Daniel Wellington brand. I have the black band and I must say it compliments silver well. 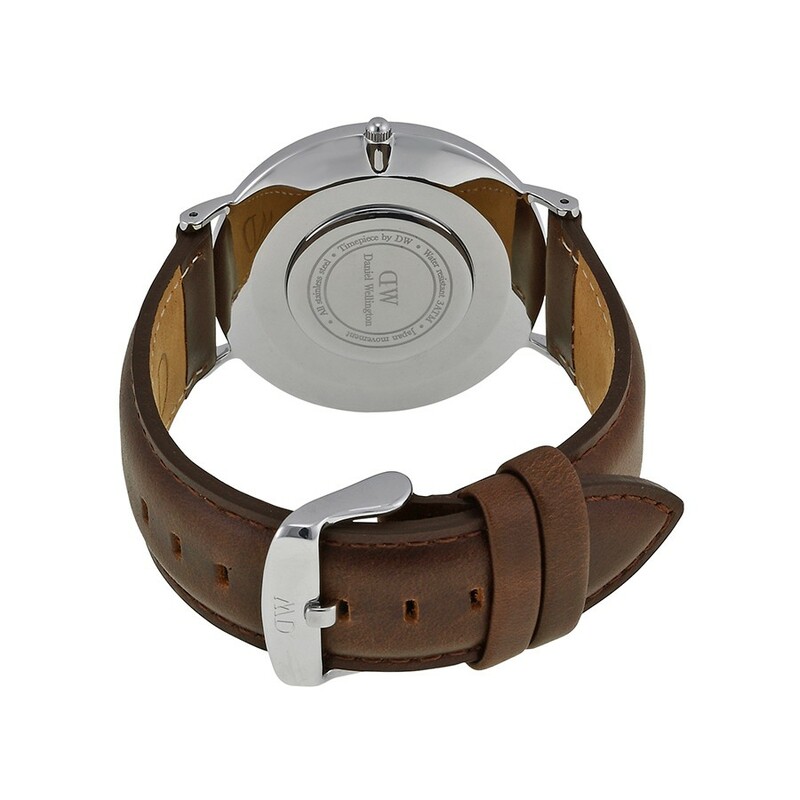 If you go with the rose gold, definitely go with the brown strap. The stitching on the brown does look a little better with the contrasting color, so that is something to consider when making the purchase. The stitching on the brown does look a little better with the contrasting color, so that is something to consider when making the purchase. So it may not be uber-impressive, but it is executed very well and works for the watch itself. I am always a fan of the meticulous design that exists in watches. 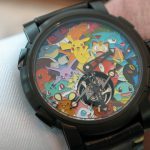 But watches of this size is even more impressive for me. Remember this watch weighs in at less than 2.5 oz and has a casing that is 6mm thick, freakin’ 6! It’s what on the inside that counts, right? The Classic Bristol keeps time like a champ. Ridiculous accuracy. 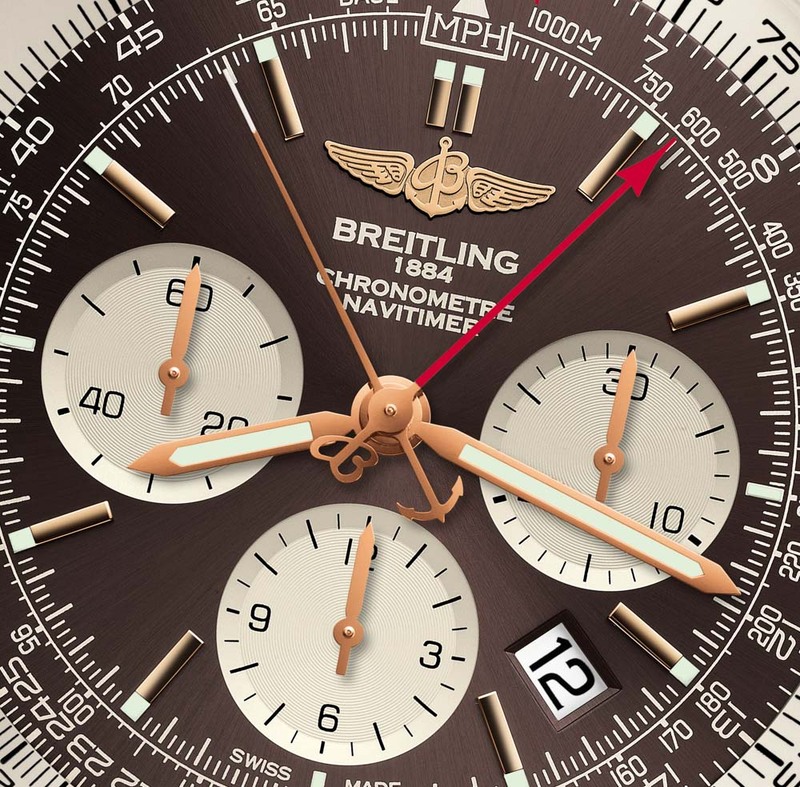 To put this into perspective, the watch is free-standing with no wireless connectivity to anything, like most precision instruments. My phone Nexus 6P, on the other hand, checks in with AT&T on a regular basis to confirm the time. So with that said, the phone should always have a pretty accurate representation of what time it is, which it does! I set my watch to match the time of the phone and 8 days later, it is still perfectly on time with the phone. That is kind of scary if you think about it. 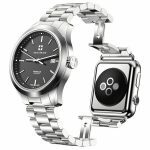 I visited a site dezenewatchstore.com and was able to learn that the second hand, which is powered by a quartz movement, moves to individual ticks. 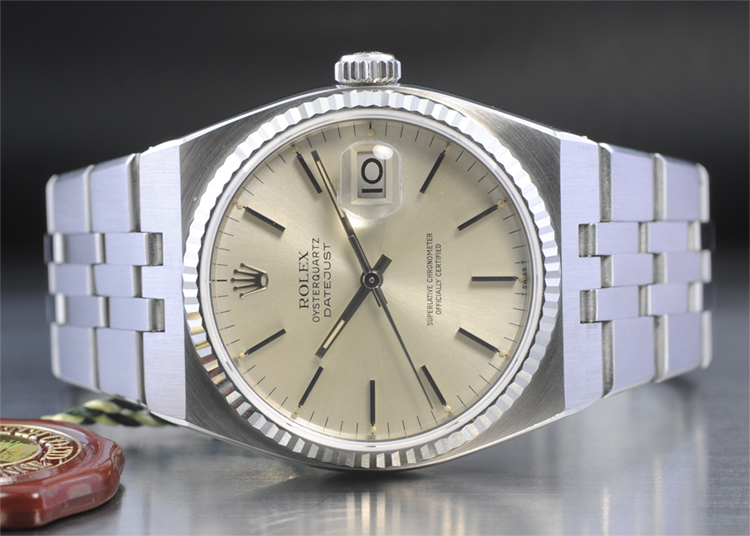 The quartz movement has less moving part and not as clunky as some mechanical watches can be at similar price points. That is great for someone that just wants a watch that tells time, and that is what this Daniel Wellington Watch Review is clearing up. I say that because, at the end of the day, the Classic Bristol is a very well made watch that is worth the investment. Fine, you have sold me, what’s the PRICE? There are a few things that may make you think twice before venturing off into buying one of these good looking watches. Some look at the Japanese quartz movement and think cheap or shotty. Perhaps the lack of complications will draw your eye elsewhere. But if you have made it this far into the review without falling asleep due to this watches lack of features, then you are already more than interested in adding this fairly inexpensive watch to your collection. The simplicity cannot be understated, the best thing about this watch to me is that it tells time and does so really, really well. It does what I expect, nothing more nothing less. But adds a definite style to your fit. 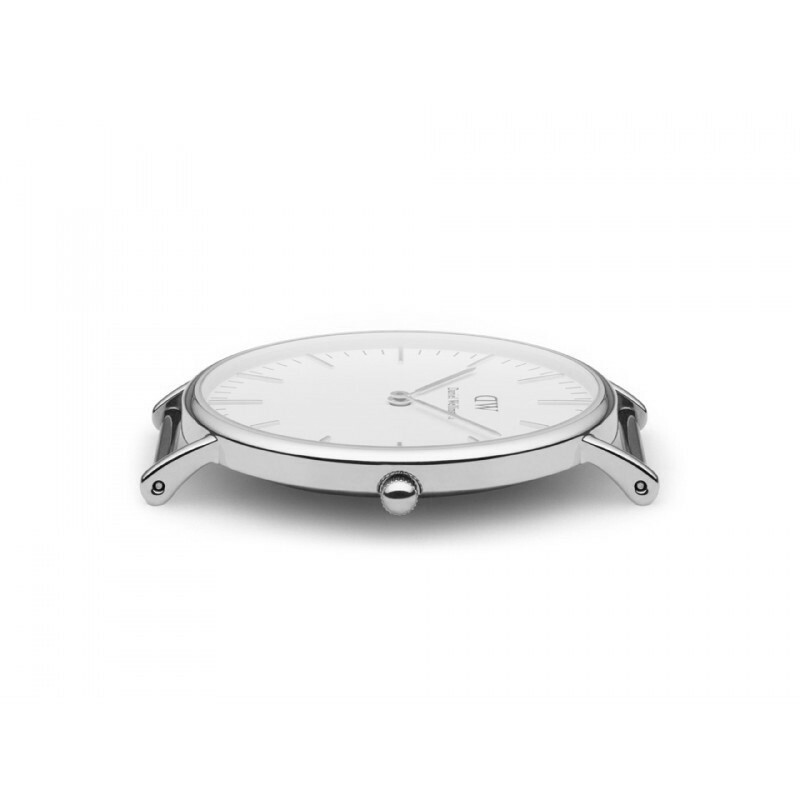 From DanielWellington.com you are going to spend around $199.00+ for this particular watch. 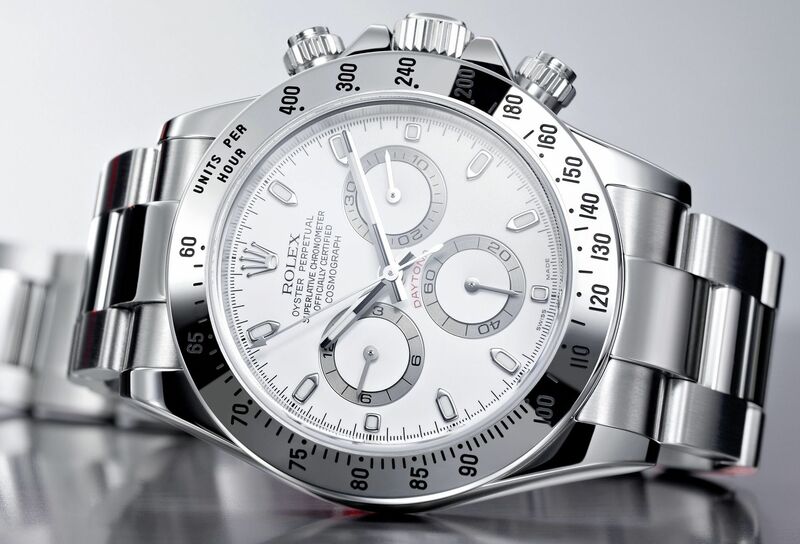 Which in my opinion is still is a tad bit over what I would want to spend for a watch that has the features that this one has. With that said, on Amazon, a brand new Classic Bristol is under $100 with free shipping. Now that is a price point that I can get behind. Just remember that you are not buying just any old watch. This is a premium precision instrument that has simplicity, elegance, and is an insanely complimentary piece to whatever you may be wearing for the day. Go for it, but look out for fakes. You will always get what you pay for. Get something that will last more than 5 minutes.